Citation: North, Bill. The prints of John S. DeMartelly, 1903-1979. East Lansing, MI: Kresge Art Museum, p. 45. Notes: Old Man Towne farmed the place next to deMartelly's. Citation: North, Bill. The prints of John S. DeMartelly, 1903-1979. East Lansing, MI: Kresge Art Museum, p. 55. 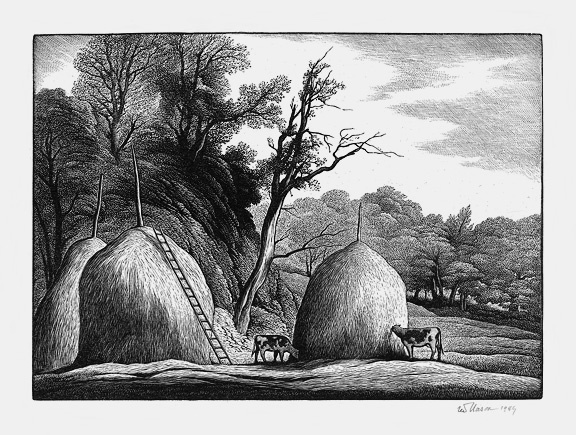 Notes: ^^^ This lithograph is based on a 1938 egg tempera painting entitled Haying. The drinking figure was assumed by North to be Newt Tolman, another New Hampshire neighbor. DeMartelly's godson, Fredric Beeson wrote to us asking for information about the 1938 painting which hung for years in the Beeson house. Notes: Priced at $250 by Aversa Antique Gallery, 2004. Citation: Cover of New Yorker, July 21, 1945. Citation: Bown, Matthew Cullerne. Socialist Realist Painting.New Haven: Yale UP, 1998. p. 232-233. Also, Russia! Catalog of the exhibtion at the Solomon R. Guggenheim Museum in NY. 2005, p. 59. Notes: Bown's translated title 'Haymaking' is more accurate than 'Reaping' the one given to this work when it was included in the Russia! Show at the NY Guggenheim Museum in 2005. But the latter's catalog description, by Masha Chelnov, is worth quoting: ' Painted during the first summer after the end of World War II, Reaping shows the peasants' peaceful daily toil. Plastov himself was of peasant origin and lived in the village most of his life; the majority of his paintings are devoted to rural life and the kolkhoz (collective farm). The grass and flowers in the foreground are painted in with rich texture and the bright, broken brushstrokes characterstic of impressionism, which was to come under harsh criticism from government officials in the late forties.' With Harvest (ID 5036), 'Reaping' won the Stalin Prize in 1946.